Kayla loves her summer job. She's a guide, or sherpa, with a group of people her age at a national park. She gets to spend all day outdoors, which she loves, but she is also working at coming to terms with her parents' deaths twelve years earlier in the very same park. Then there's Lucas—dark, mysterious, and harboring a dangerous secret: he's a werewolf, and obligated to protect his pack from the dangers that have discovered them. All the while, Kayla and Lucas can't deny their growing attraction, and it's becoming clear that Kayla will soon have to choose between two worlds. Moonlight is an absorbing and quick read with werewolves as the main focus of the novel, a group that is oftentimes overlooked in YA paranormal fiction. The book isn't very long, and the storyline is a little predictable at the very beginning, but it's a very engaging and brisk read that will appeal to reluctant readers and even has a couple of mildly surprising twists as the book works its way up to the climax. 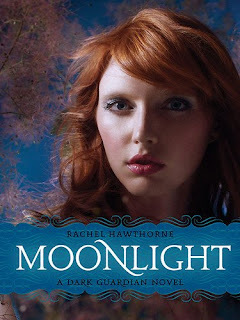 Moonlight possesses a nice mixture of romance, adventure, and werewolf action that will especially please those Team Jacob fans, which makes it easy for readers to overlook how easily everything comes together, and the rather choppy ending. Moonlight won't have you at the edge of your seat, but it is a satisfying and unique book with a romantic, happy ending. The second book in the Dark Guardian series is Full Moon. Lindsey is wild and reckless, a natural rebel—maybe because her entire life was laid out for her even before she was born. Her parents are among the most powerful members of the Dark Guardians, an ancient tribe of werewolves, and they arranged Lindsey's betrothal to Connor long ago. The next full moon is coming all too soon, and then her commitment to Connor will be final—no turning back. She should be happy . . . so why can't she stop thinking about gorgeous, brooding Rafe? When a dangerous threat on the pack escalates, so do tensions between Connor and Rafe. A fight over Lindsey is imminent, but will it be to the death? 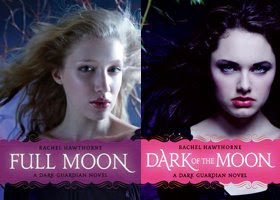 The third book in the Dark Guardian series, Dark of the Moon, will be released next month. This sounds amazing I am going to have to pick them up! Great Review!!! Sounds like the classic Romeo and Juliet love affair. Sounds amazing! Wow, this sounds really coo :) thanks for the great review!